Nestled between busy Wenceslas Square and Prague’s number one tourist destination, Old Town Square, the House of the Black Madonna houses a small museum of Cubism as well as the only surviving Cubist café in the world – the Grand Café Orient, which was renovated between 2002 and 2005. 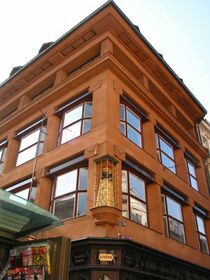 The House of the Black Madonna, photo: Radio Prague Here, I recently met with architect Zdeněk Lukeš, who is the author of an extensive monograph dedicated to the building’s architect, Josef Gočár. I asked Mr. Lukeš about Gočár’s significance for Czech architecture. The House of the Black Madonna was built between 1911 and 1912. I asked Mr. Lukeš where the name of the house came from. When Gočár was asked to design the house in mid-1911, he was only 31 years old. His success with the design of the Wenke Department Store in Jaroměr impressed the wholesale merchant František Josef Herbst, who hired the emerging architect to build a department store in Prague’s Old Town, along the old coronation route. Due to the location in the heart of the city, the design of this building was subject to strict conservation laws. 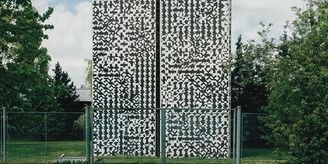 In a daring move, Gočár altered his first plans for the house after he came in contact with a new movement in Czech architecture – one he should become a pioneer of. Gočár’s initial plans had not been well received by the historical buildings authority in Bohemia, but Prague’s City Council eventually approved the plans on August 4, 1911. The house was built with a reinforced concrete skeleton, which allowed for large interior spaces without ceiling support – a building style that was better suited to Cubist aesthetics. 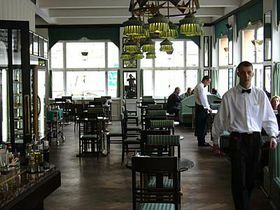 Grand Café Orient, photo: Radio Prague On the first floor of the building, the Grand Café Orient opened its doors. The ground and the second floor of the building originally housed the department store. 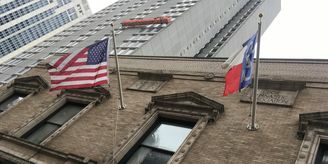 On the floors above, apartments were located. In the middle of the 1920s, the store and café were converted into bank offices. During communism, the building was divided into office spaces and later became the state exhibition agency. 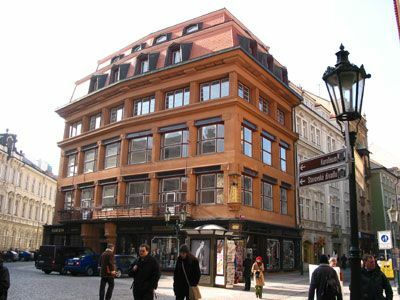 After the Velvet Revolution, in 1994, a Czech art and culture center was housed inside the House of the Black Madonna. Following an extensive renovation of the building in 2002 and 2003, the Museum of Czech Cubism opened its doors here. Visitors can see Cubist visual art on the fourth and fifth floors of the House of the Black Madonna, where the museum is housed. 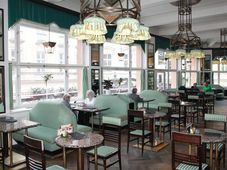 In 2005, the Grand Café Orient was restored to its former glory, with the help of old black-and-white photographs of the original interior. 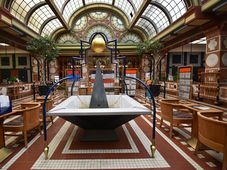 It is a sort of living museum of Cubism, since it provides a rare glimpse at one of the few Cubist interiors that exist today. Architecturally, the House of the Black Madonna is not strictly Cubist. While for the first two floors, the façade is dominated by the expressive style, which was influenced by Pablo Picasso’s Cubist visual art, the building’s third floor breaks with the Cubist tradition, as well as its roof, which resembles baroque double roofs. These non-Cubist elements were supposed to reconcile the building with its surroundings. In architecture, the heyday of Czech Cubism was rather short lived – the movement was most active between 1910 and 1914. In architecture, the best-known proponents of Czech cubism were Pavel Janák, Josef Chochol and of course Josef Gočár, who incorporated the style into many of his works. 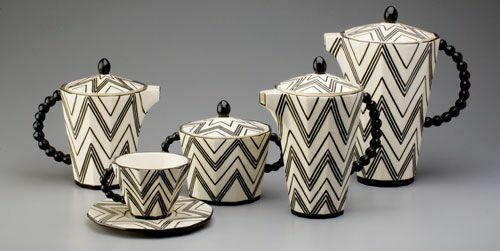 As a matter of fact, the Czech contribution to Cubism was quite unique, since Bohemia’s architects and designers used its pyramid and crystal forms not just for buildings, but also for three-dimensional objects, such as coffee sets and furniture. Later, Gočár turned away from Cubism. He built the Legionnaire’s Bank in Prague, as well as the Church of St. Wenceslas in Vršovice, one of the best examples of modern architecture in Europe. 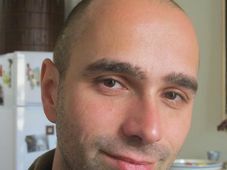 However, it is his work in Cubism that influences young Czech and international designers today. While the style is certainly unique and can be challenging for architects to put into action, Cubist decorative items continue to fascinate many artists today. Coffee set by Pavel Janák “Some nice examples are the coffee sets of Pavel Janák, they are not very practical but very beautiful. And I think that was the only Cubist design in Europe at the time but it has been very inspirational for today’s designers, and the same goes for Cubist architecture. I saw a Cubist house in Berlin about ten years ago, which was designed on the inspiration of Chochol’s houses here in Prague. And now we have one perfect example, just here in Prague, in Karlín, by a group of young Swiss architects, an office building with a Cubist façade. In Prague, the House of the Black Madonna is certainly a good starting point to see some beautiful examples of Cubist design and architecture – and for those who would like to add some Cubist touches to their home, the museum’s gift shop sells replicas of Pavel Janák’s famous Cubist coffee sets and even Cubist furniture. The episode featured today was first broadcast on January 25, 2012.